“I think that the open access activists will win out”: world wide web creator, Sir Tim Berners-Lee. Activists pushing for free, open access to academic papers will eventually defeat publishers who seek to lock scholarly findings behind paywalls, the founder of the world wide web said today. 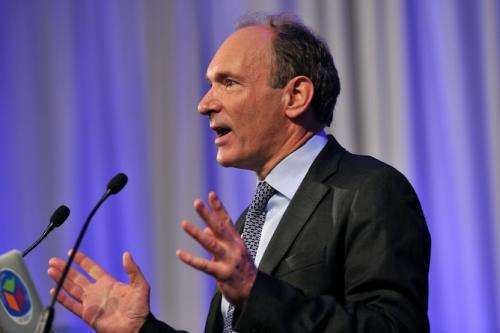 Sir Tim Berners-Lee, who revolutionised the way we access information on the internet through the creation of the world wide web over 20 years ago, has been a vocal proponent for making data freely available while also protecting people's privacy. Higher education institutions and individuals pay millions every year to academic journals to subscribe to academic journals but open access activists, including the recently deceased Aaron Swartz, have been pushing for free access to scholarly findings. "I think that the open access activists will win out," said Sir Tim, speaking at the launch of the $40 million CSIRO's Digital Productivity and Services Flagship on Tuesday. "A lot of publishers realise that's the way that is going. The unfortunate death of Aaron Swartz brought… that whole battle to many people's attention," he said, adding that an open access model gives the most benefit to the most people. "There is a fairness argument, for people in Africa, people who are not at large universities, there are people who just don't have access to the papers," he said, adding that access to the data that informs academic papers is also important. "A lot of the data is publicly funded already so it should be available and a lot of the publishers are moving to open access models." When asked about an Australian government proposal for individual data logs to be stored for up to two years, Sir Tim said it was important for governments to be able to fight cyber crime and state sponsored cyber terrorism. "Having said that, there are the dangers of snooping on people. If you do snoop on people, you are not going to get a criminal. They are going to use Tor," he said, referring to a system that allows internet users to communicate anonymously. "That [logged] information will not go to stopping serious criminals, only people who have taken out too many library books." Such a system would produce a world in which a teenager who needs to visit an online forum to find out information about his or her health or sexuality would have that information tracked for two years and data on powerful people's web habits could be stolen and used for blackmail, he said. Sir Tim warned Australians to "beware a government that has the ability to control what you can see on the web". Danny Kingsley, Executive Officer for the Australian Open Access Support Group, welcomed Sir Tim's comments on the future of open access publishing. "There is no doubt that open access is necessary for humanity to be able to effectively tackle the very real large scale issues the world is facing. We need the entire research community sharing their findings to build solutions," she said. "This is not happening when many of the world's researchers or their institutions are simply unable to afford subscriptions to journals. But there are large barriers, no matter how strong the argument for the fairness of open access." Dr Kingsley said the promotions and grants systems that most Western researchers operate under supports the current status quo. "Until the emphasis on publication in established high impact subscription journals and on metrics as a measure of quality is altered, open access will face ongoing challenges. The recent implementation of open access policies by Australia's two main funding bodies, the National Health and Medical Research Council and more recently the Australian Research Council are a very good sign for open access in Australia." Stephen Conroy, Minister for Broadband, Communications and the Digital Economy said the CSIRO's Digital Productivity and Services Flagship "will play a key role in helping to address Australia's productivity challenge." Mr Conroy said the flagship, which will focus on research into health, government services and secure infrastructure, will contribute to the economy "through real and measurable improvements to the services sector". "Australia depends on such improvements in efficiencies," he said. This story is published courtesy of the The Conversation (under Creative Commons-Attribution/No derivatives). Couldn't agree with him more. All the scientific open access community needs is an international body to organize peer review. Without that publishers still have the upper hand.